1. Ready to Rock – Marcia Baldwin’s latest painting reminds me how important music is to my own art. Do you rock out while you paint? Check her blog for purchase details. 2. Cleaning my Studio and Hanging it in Record Time – And it was all caught on camera. Check out this great video from Claudia Roulier! 3. 11 Tips for Creating, Promoting, and Holding a Twitter Chat About your Art – If you’re an artist and you’re on Twitter this is the article for you. Need I say more? 4. EBSQ Winter Sale – Membership to EBSQ is still on sale. Don’t miss out on a great opportunity to show your, participate in online exhibits and connect with other artists. You may recognize this week’s EBSQ Blogger of the Week by his musically inspired artworks. He is one of our most unique and talented artists – a Printmaker to be exact. I’m thrilled he’s taken the time to share a bit about his art and his blog! I’m Paul Helm and I live and work in wonderful Wimbledon (yes that Wimbledon!). I lived for 7 years in Verona, Italy and still have an apartment there which we try to get to as often as possible. I have had a career in teaching, printing and publishing. I had my own framing shop and gallery and now I am able to spend my time printmaking, painting and building an online business. After closing my framing business I kept the equipment which I now use for framing my own work. I like to combine traditional printing processes with modern digital techniques. I love to experiment. As it grew it was difficult for visitors to find any new content. Part of my solution was to create a blog with the intention of announcing any new content on the website and to generate traffic. However I’m not very disciplined and I like to add any other item of interest. 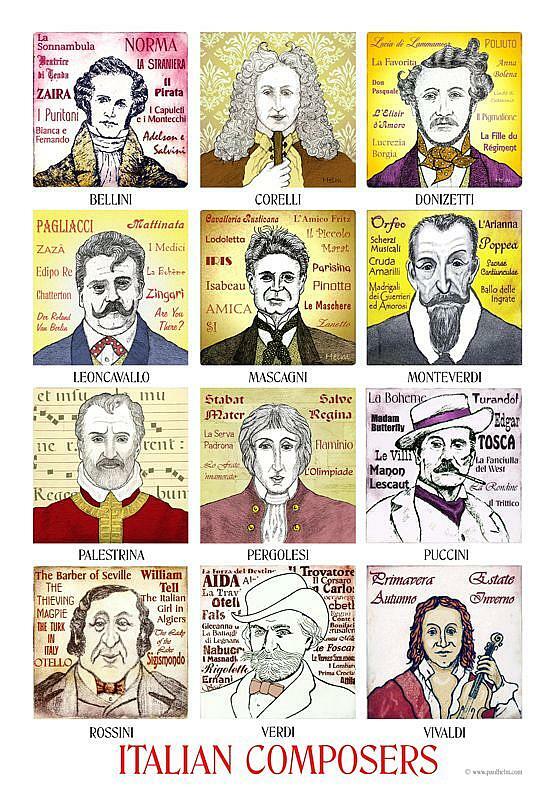 I later started another website www.52composers.com which uses my series of portraits of great composers. I therefore started adding material relative to this site also. My personal view is that it is more important to have a website than a blog. A blog is not a substitute for a website. But a blog is a very powerful and important means of promoting your website and driving traffic to it. The most common advice is that you must update it frequently (advice which I am guilty of neglecting). If you don’t yet have a blog or a website – start first with a blog. It is easy – Do it now! Since I started my series of portraits of great classical composers I find it helpful to listen to the music of the particular composer I am working on at the time. When doing Puccini I listened to Madam Butterfly and Tosca. Carmen when I did Bizet. West Side Story when I did Leonard Bernstein. At the moment I am completing a series of 12 German composers so I am enjoying the music of the 3 B’s – Bach, Beethoven and Brahms. The composer series are all done using photoetching and collagraph printing techniques so no easel is involved! I am though working on a Heroes and Villains series and these are painted in oils or acrylics on canvas using my easel. The next will be a portrait of Simon Bolivar. Thank you Paul for being an EBSQ Blogger of the Week!